First 5 LA will help preserve more than 3,200 child care slots at 11 nonprofit child development providers in Los Angeles County through an investment in the Los Angeles Early Childhood Education (LA ECE) Bridge Fund. A product of the Low Income Investment Fund, or LIIF, the LA ECE Bridge Fund provides financing for early care and education providers in L.A. County facing delays in state child care subsidy payments. Launched with support from the California Community Foundation and First 5 LA, the fund currently preserves and promotes the accessibility of quality early learning opportunities to nearly 1,000 children each year. Modeled after LIIF's successful programs in San Francisco and Alameda Counties, the LA ECE Bridge Fund has invested more than $3.5 million in child care providers to date. The third round of bridge funding of nearly $1.8 million was awarded to 11 organizations in L.A. County, preserving a total of 3,291 child care slots, 529 staff jobs and 2,734 parent jobs. The LA ECE Bridge Fund currently preserves and promotes the accessibility of quality early learning opportunities to nearly 1,000 children each year. "The Los Angeles Early Childhood Education Bridge Fund is completely aligned with the Low Income Investment Fund's mission. It fills a critical financing gap for early education providers and preserves access to high-quality early childhood education," said Candace Wong, director of California child development programs at LIIF. "LIIF is proud to partner with the California Community Foundation and First 5 LA to bring this resource to Los Angeles County. Together, we are helping working parents and improving the overall quality of care available to all Los Angeles County families." In this third round of funding, First 5 LA is providing $75,000 for administration, training and technical assistance. First 5 LA is also providing a loan of $1 million to grantees, which will be repaid next year. 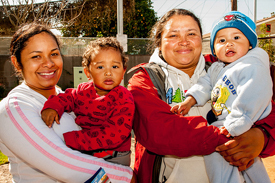 "Working together with the California Community Foundation and LIIF to provide temporary funds for child care facilities is a critical component of maintaining access to needed services and building economically stable communities in Los Angeles County," said Kim Belshé, executive director of First 5 LA. The LA ECE Bridge Fund helps high-quality child care providers, which are often small businesses, manage their cash flow and bridge the timing of state payments. Long Beach-based Comprehensive Child Development, or CCD, is receiving its second year of support through the fund. CCD serves over 400 children every day through a network of child care centers and family care providers. "The LA ECE Bridge Fund gave us the assurance that we would be able to pay staff and, most importantly, ensure that our services would go uninterrupted for children and parents," said CCD Executive Director Tammie Kyle. "The LA ECE Bridge Fund helped remove many barriers we faced in traditional financing markets and allowed CCD to continue to offer high-quality, affordable care for our community." The LA ECE Bridge Fund financing will help keep CCD's facilities open, including a site that serves 53 children at the Villages at Cabrillo. The CCD facility provides child care alongside comprehensive services for veterans and homeless families, including transitional housing and medical services.